Moose Creek Lodge is located in the north and western side of the Blue Ridge, GA area. Travel the beautiful road of HWY. 5, passing the popular Mercier Orchards, to a tucked away property off a small gravel road, with the rushing sounds of Fitghtingtown Creek as your neighbor. The cabin is about 12-15 minutes from the town of Blue Ridge, though not that many miles away. 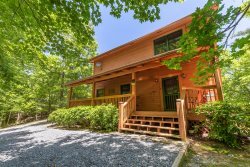 The property is very close to Lake Blue Ridge, the Toccoa River, the Cashes Valley area for horse back riding, the Ocoee River for White Water Rafting, Zip Lining in the Devils Den area, and many other unique outdoor action and adventure locations. The staff checked on us and were so very kind and helpful. We will definitely come to this cabin again! The peaceful location and the spaciousness allowed our family and friends to gather and everyone had a great time without being crowded. The team was very responsive and knowledgeable. I liked the way GA Mountain Cabins stayed in touch throughout the rental process. We enjoyed the trip very much. The cabin was immaculately clean and in great condition and we loved that it had the view of Fightingtown Creek. Just across the creek we could see deer, rabbits and cattle at various times. The hot tub was great. We didn't get to use the fire pit because of rain during our stay, but that is also a really good feature. Team members were helpful and friendly. Loved everything about this property! Can not wait to return. The team members were very helpful, friendly and suggestive on a variety of things we could have done had we left the property. There was a total of 11 of us and every member enjoyed themselves. The Hot Tub, Fire Pit and meal time experiences were all amazing. Thank you for a great experience. Everyone was really friendly and helpful. The cabin was beautiful and when I called with questions or a problem, everyone was courteous and helpful. I LOVED MY BIRTHDAY WEEKEND IN THE GEORGIA MOUNTAINS, EVERYTHING WAS BEAUTIFUL AND RELAXING. We enjoyed our family trip and will be back. We have already told our friends about the cabin and recommended that they go and stay. The team members were very courteous and informative about the location and recreational activities. We loved the property a lot! It was beautiful and look d even better than the pictures portrayed! We were very please with our stay! The cabin was clean, decorated for Christmas, dishes, utensils, cups, were amble, and the space was nice. Staff were nice, friendly and helpful. Our check in process went very smooth, everything were prepared and discussed to us by the staff. We had a wonderful time, best vacation by far. We Love our cabin and the peacefulness of the area. We really had a great time. Our stay was an amazing adventure. It was an easy process to book and to get to our cabin....information was well organized. Wonderful company to rent from, will be back!